In the paper, we propose a new focus in qualitative organization studies, which we call organizational anecdotal evidence. The novelty of our method is in linking storytelling, studies of organizational anecdotes, and humor studies. We claim that organizational anecdotes, jokes, and short fictional stories should become a core object of organizational culture analysis, rather than be refuted as unimportant. This is so because the study of organizational anecdotes and fictional stories shared by the social actors is more meaningful and gives more insight into their culture than establishing mere facts. 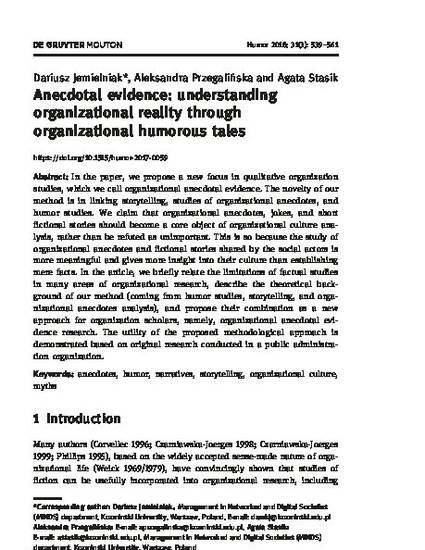 In the article, we briefly relate the limitations of factual studies in many areas of organizational research, describe the theoretical background of our method (coming from humor studies, storytelling, and organizational anecdotes analysis), and propose their combination as a new approach for organization scholars, namely, organizational anecdotal evidence research. The utility of the proposed methodological approach is demonstrated based on original research conducted in a public administration organization.